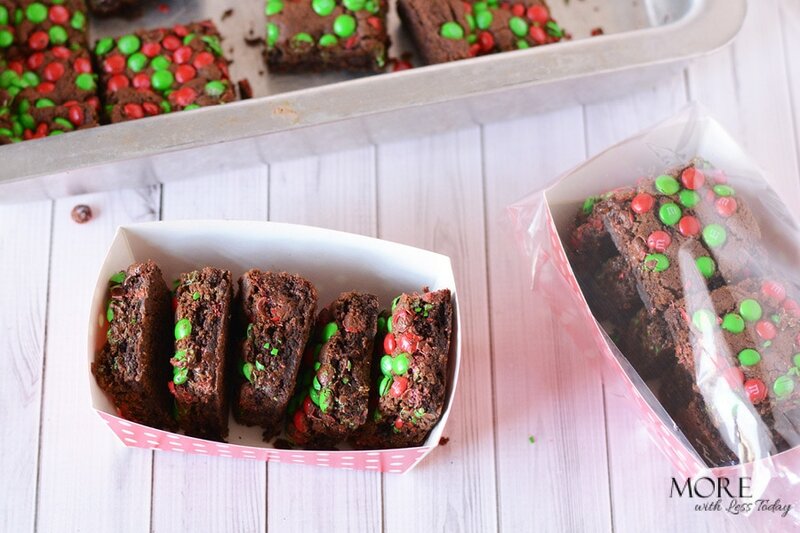 If you are baking for the holidays, our Double Chocolate Cookie Bars are perfect for entertaining at home or packing up to take to a holiday party or event. This post is in partnership with Acorn Influence on behalf of Arm & Hammer Baking Soda and Gold Medal Flour. All opinions are 100% mine. I like making cookie bars over actual cookies. I think they stay moist and fresh longer than cookies. They stack well, they travel well, they package well, too. Everything you need to make these delicious Double Chocolate Cookie Bars is found at Walmart in the baking aisle so you know you’ll find quality brands and the best prices. Pro tip: Stock up on baking supplies when you shop. 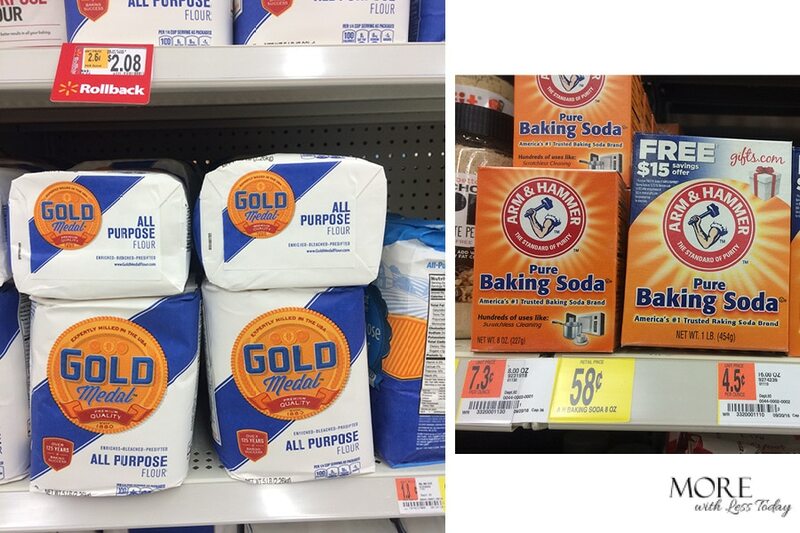 You can never go wrong with Arm & Hammer Baking Soda and Gold Medal Flour. You’ll be prepared for last minute invitations or for guests that drop in. It’s just part of the frenzy of the holidays! Find your quality ingredients in the baking aisle at Walmart. 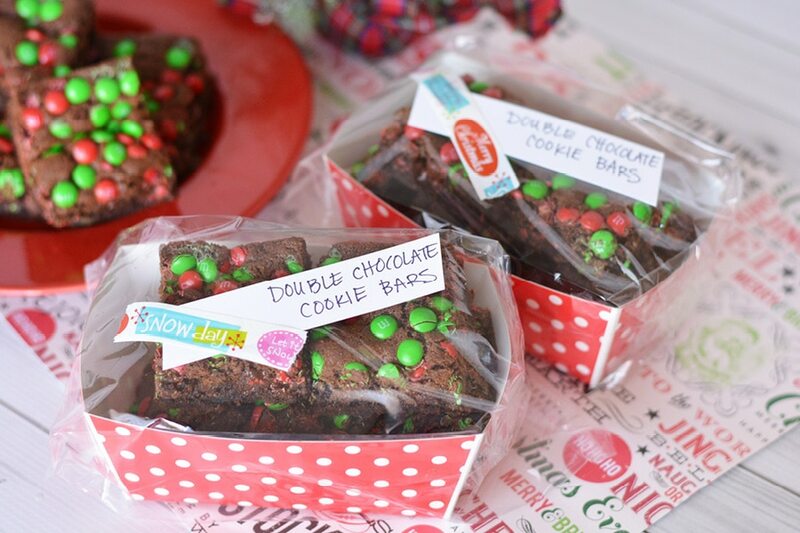 Here is everything we used to make and take our Double Chocolate Cookie Bars. Preheat oven to 375 and grease a 9×13 pan with cooking spray. 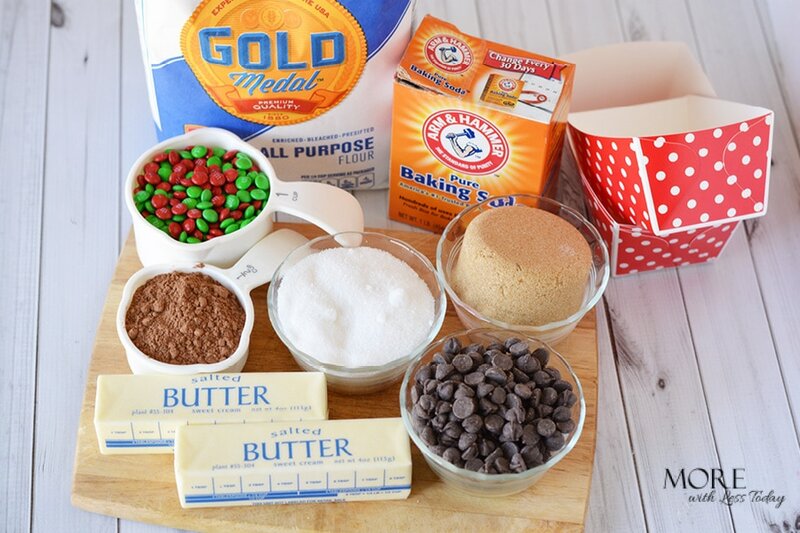 In a small bowl, combine Gold Medal All-Purpose Flour, baking cocoa, Arm & Hammer Pure Baking Soda, and salt. Use a whisk to mix the dry ingredients together well. Set aside. Beat the butter, sugars, and vanilla together with a mixer until light and fluffy, about 3-5 minutes. Spread dough into prepared pan. Simply use your hand, covered with a plastic sandwich bag, sprayed with cooking spray to press the dough easily into the pan. Top with baking M&Ms and gently press them into the dough. Bake for approximately 22-26 minutes or until the edges start to pull away from the sides. 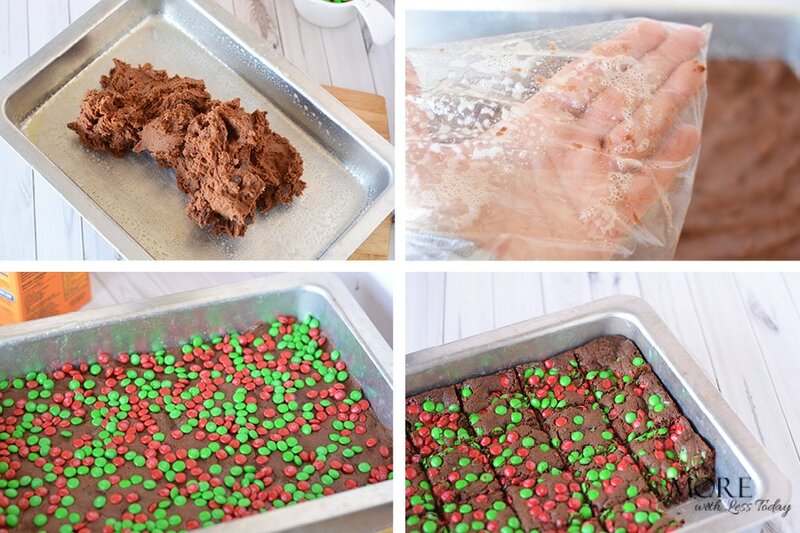 Be sure to let the cookie bars completely cool before cutting into 24 bars. Place the paper trays (also found at Walmart) into a clear cellophane bags and tape ends shut with clear tape. Cut small strips of card stock and write the cookie name on the paper with a marker. Add the small tag to the top of the package with decorative tape. Save some for your family to enjoy! 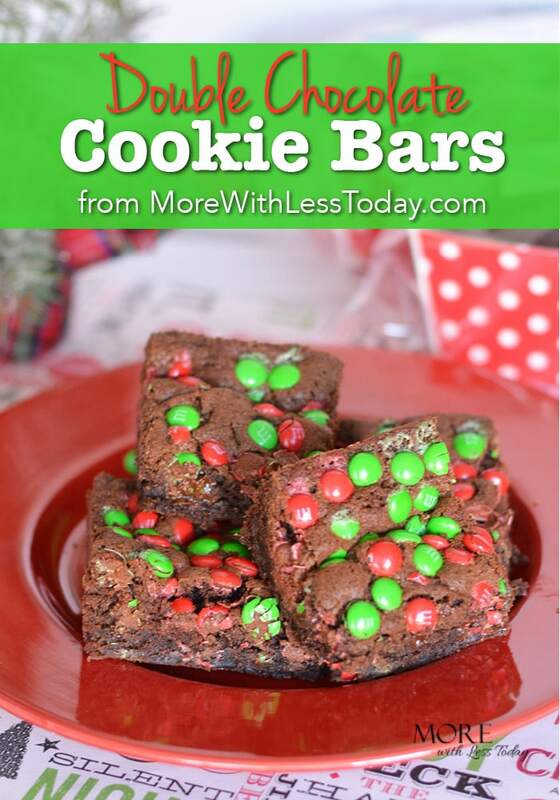 These Double Chocolate Cookie Bars are easy to make and perfect for your holiday cookie swap! Preheat oven to 375 and grease a 9x13 pan with cooking spray. In a small bowl, combine Gold Medal All-Purpose Flour, baking cocoa, Arm & Hammer Pure Baking Soda and salt. 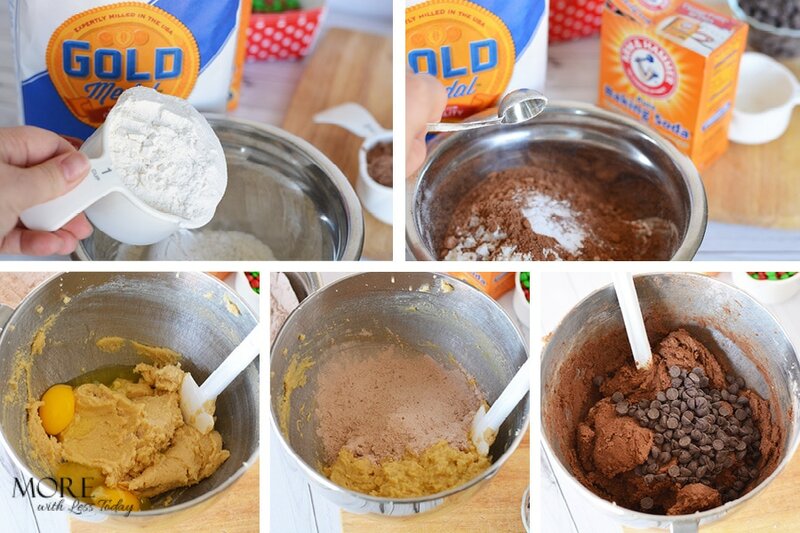 Use a whisk to mix the dry ingredients together well. Set aside. Beat butter, sugars and vanilla together with a mixer until light and fluffy, about 3-5 minutes. Spread dough into prepared pan. Use your hand, covered with a plastic sandwich bag, sprayed with cooking spray to press the dough easily into the pan. Bake 22-26 minutes or until edges begin to pull away from the sides. Cool completely before cutting into 24 bars. Place bars into paper mini muffin trays. Place trays into a clear cellophane bag and tape end shut with clear tape. That’s my kind of dessert or snack. Love chocolate bars and love M&Ms too! Yum! Yum! well hello tasty treat! And hello sweet tooth that had just woken up by the sight of that delicious irresistible, mouth-watering treat! mmmm mmm! Loving those holiday M&Ms! 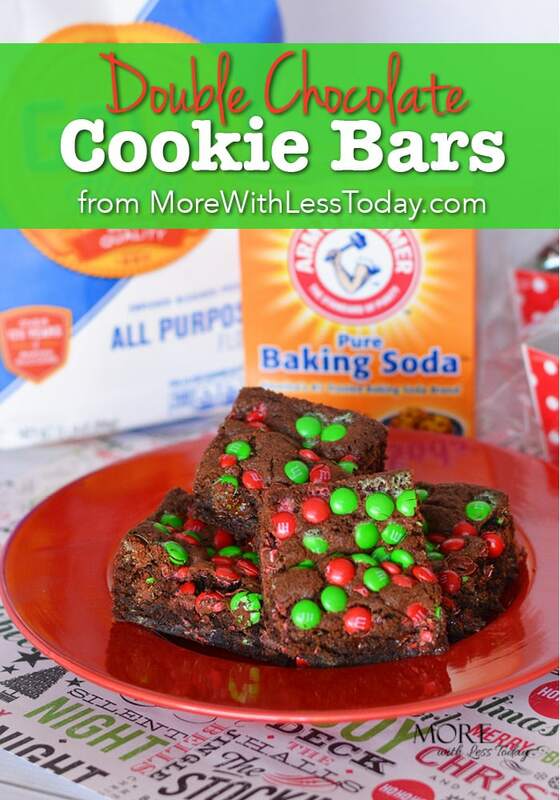 They are so fun to add color to a christmas treat. Looks delicious! These double chocolate cookie bars look amazing. I will try them for lunch this week. I am always looking for a delicious dessert to serve the kids.